Wow! 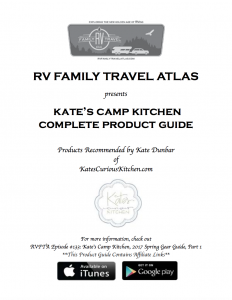 How lucky we are here at Princess Craft to know Kate Dunbar and have her share all of her campground cooking expertise with us! Too many times we make excuses for… well… just about everything, really! But when it comes to camping, cooking, enjoying some time off with the family, we should all take some advice from Kate. Kate has twins, 11 years old, a busy husband and all the responsibilities that come along with it. How does she take care of herself, her family and do all the amazing things she does? 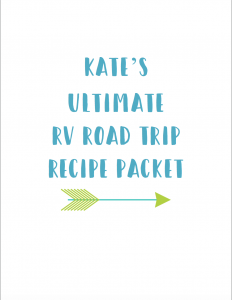 Click here to download Kate’s Ultimate RV Road Trip Recipe Packet! She prepares. That’s what I learned at Princess Craft’s monthly Happy Hour get together with Kate’s Curious Kitchen. Now I’m not a good cook, and getting organized is not my best attribute, but check this out! It’s literally 5 weeks of recipes, how to prep and package them, AND… a shopping list! 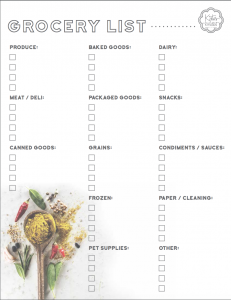 Click to Download this template of Kate’s shopping list! I CAN DO THAT! And if you want to know what she includes in her outdoor kitchen, she gives you that, too! I was glad to know that with just a few pieces of equipment I could have an amazing outdoor cooking experience, eat great food and lose the daily stress of figuring out what the heck we were going to eat! No excuses. Make the time for yourself. Use Kate’s simple plans and recipes, and go have some fun! 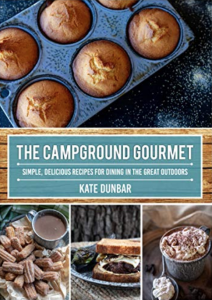 Click here to check out Kate Dunbar’s new book, now available on Amazon! And don’t forget to like us on Facebook so you can join us for the next Happy Hour!